The latest installment of RiP’s FoTS-series is 14 pages long, 1 page front cover, 1 page editorial, 2 pages of advertisement and 1 page SRD, leaving 8 pages of content, so let’s check it out! Following my format for the FoTS-series, I’ll start off with the lowest CR: AT CR 8, Smiles is only an advanced, nightmare laughing beast greymalkin and provides the following additional content: 2 traits related to dreaming, a ring that grants it the power to partially become invisible (concealment) and multiple templates: The Dream creature (CR +2), the Apex creature (CR +2), Laughing Beast ( CR +1) and the Nightmare Creature (Cr +1) templates. 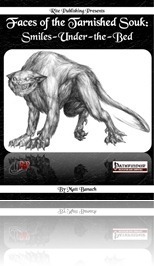 At CR 13, we get advanced dream eater laughing beast nightmare greymalkin, while at CR 19 Smiles has become an apex-predator indeed. As has become the default assumption of the series, Smiles comes with dreamburning information and a how-to-use sidebar. Her cover-artwork is supremely creepy. It should be noted that no additional quick-template variants as in some of the installments are provided – one incarnation per CR. Editing and formatting are top-notch, I didn’t notice any glitches. Layout adheres to a 2-column b/w-standard and the artworks apart from the cover are stock. The pdf has no bookmarks, which is a minor bummer. I was slightly bummed that the creature comes without the mini-template modifications to further customize the creature. All right, I’ll come out and say it: I’m a sucker for Alice. I bought the Norton critical, annotated edition and analysed the books up and down. And the Cheshire cat is in my opinion one of the most creepy, disturbing creatures in fiction. Smiles-under-the-bed, though, is even worse, combining the partial invisibility with a keen intellect, madness-inducing abilities and a humour ripped straight from my favourite super-villain ever: If I had to describe the creature, I’d settle for “Cheshire cat meets the Joker”. This combination is plain awesome and of all the FoTS-characters so far, my personal favourite. Add to that the tragic angle of a creature created by centuries of rejection and the option to actually feel sorry for it and you have a hunter that becomes even more dangerous! In spite of perhaps being not the most complex of the FoTS-characters, nor the most versatile, the build is AWESOME and should guarantee that the thing that lurks under your bed, its insane humour and its demented plan to reach for godhood should not be vanquished too easily. I love this installment. It’s glorious. Matt Banach’s first solo-venture in the series is a mind-blowing success – 5 stars + endzeitgeist seal of approval.